Cinnamon Spice Cake is delicious, especially when you top it with cinnamon cream cheese frosting. This low carb spice cake recipe without applesauce is delicious in fall and throughout the holidays…or any time. Mmmm, spice cake. This recipe is long overdue, because honestly…you just need to have spice cake in your life, am I right? The problem is that most spice cakes use applesauce as a key ingredient and that means they can’t be low carb. Total bummer. You, my friend, are in for a treat! 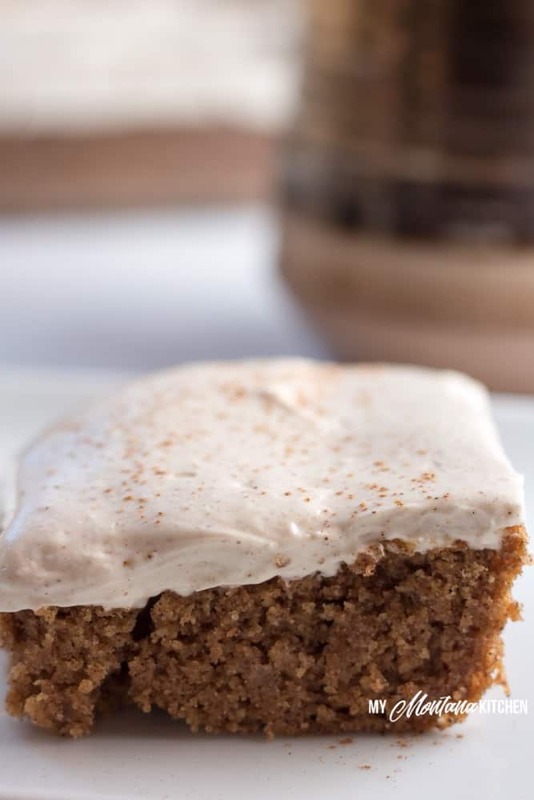 This absolutely delicious and super simple cinnamon spice cake recipe without applesauce is 100% okay for low carb enjoyment. And when you top with the cinnamon cream cheese frosting? Well, now you’re talking a whole new level of decadent deliciousness. Hungry yet? Me, too. So how do you get a moist, soft spice cake without using applesauce? Good question. It’s all about the coconut oil. Which also makes it a nourishing, healthy dessert in addition to an easy low carb treat (and those are the best kind!). And instead of using applesauce and a pre-mixed spice blend, you’re just going to use a few spices you likely already have on hand: cinnamon, ground cloves, and nutmeg. So easy, but so flavorful! 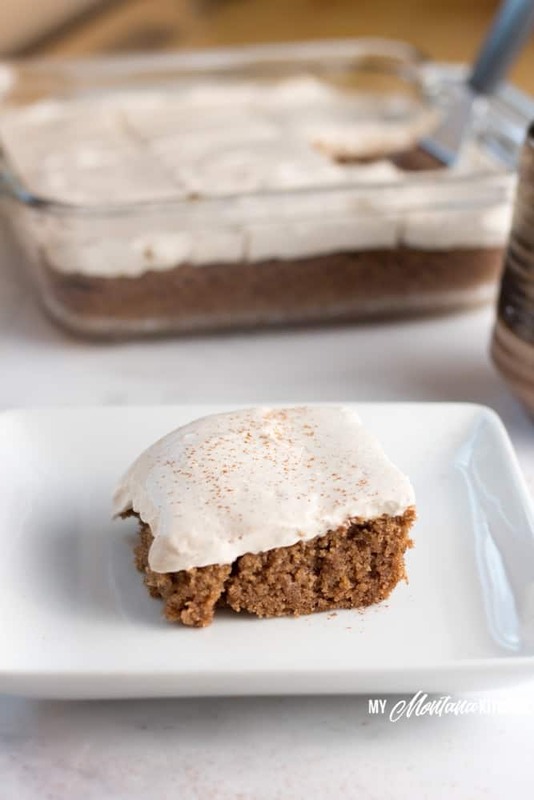 This healthy low carb cinnamon spice cake is simple. You can set your oven to preheat while you get mixing! Psst. This would be a good time to pull out the cream cheese for the frosting, too, so it’s softened and ready to use when it’s time. This recipe is super similar to these delicious low carb Pumpkin Bars, which are a favorite here at My Montana Kitchen. So if you’ve made those, then this will be even easier for you. And if you haven’t? Well, you’ll want to once you taste how good this recipe turns out! It can be tempting to just drop all your ingredients into one bowl, but resist the urge. Resist. Now, the wet ingredients are a little tricky if you don’t plan ahead. Melt your coconut oil and then add warm water to it. Not cold, not room temp. WARM. Why? Because if you don’t, then it’ll start to solidify your coconut oil and you can’t have that happening. Go ahead and add your vanilla and eggs as well, mixing thoroughly. Go ahead and add your wet to your dry. Mix it well. The batter’s going to be bit thick; that’s okay. 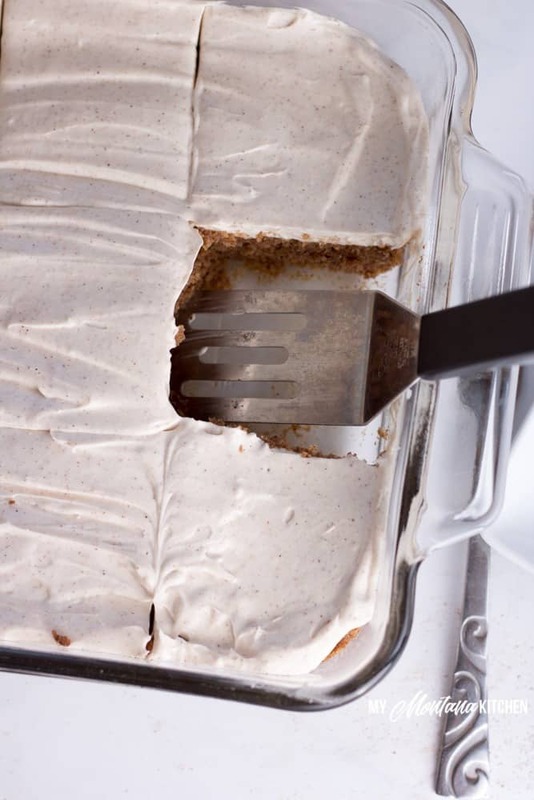 Use a spatula and pour it into your greased 8×8 cake pan. Bake it for about 30 minutes, until the center is dry. Once you remove it from the oven, be sure to let it cool completely. While your cake is cooling, it’s time to whip up your delicious, lightly spiced cinnamon cream cheese frosting. Put your softened cream cheese in a bowl and use a mixer to whip it up until it’s soft, creamy, and fluffy. Next, add in your gentle sweet, cinnamon, and heavy whipping cream. Keep beating for a minute or two. Spread it onto your fully cooled cake. This frosting is great for way more than just this recipe, too. You could spread it on top of low carb pumpkin bagels for a special, sweet breakfast. Or on top of these coconut pancakes. It would also be absolutely amazing spread on low carb waffles. Oooh, just think of it melting into those little squares on a hot waffle at breakfast time. Mmmm. If you’re like me and you love all things spice cake, this recipe make a fabulous low carb breakfast muffin for a quick morning meal, too. Or you could add the frosting and have healthy cupcakes! This is such a fabulously simple and versatile recipe that you’ll find yourself using it whenever you want the taste of fall. 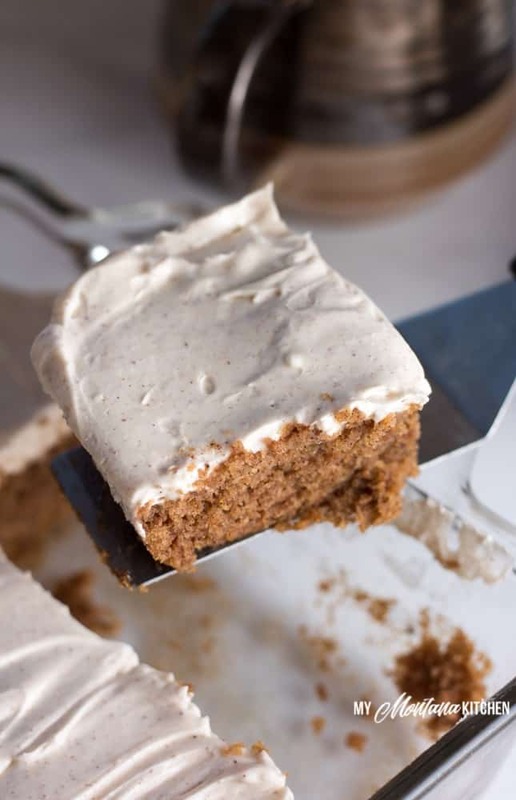 Cinnamon Spice Cake is delicious, especially when you top it with cinnamon cream cheese frosting. This low carb spice cake recipe without applesauce is delicious in fall and throughout the holidays...or any time. Add melted coconut oil, vanilla, eggs, and warm water and mix well. Pour batter into a greased 8x8 cake pan (it may be thick). Beat softened cream cheese until fluffy. Add Gentle Sweet and heavy whipping cream and beat for 1-2 minutes. Spread frosting onto cooled cake. If you do not have the Trim Healthy Mama Baking Blend, you can use ⅓ cup each of almond flour, coconut flour, and flax meal. If you do not have Gentle Sweet, you can use my Low Carb Powdered Sugar in equal amounts. 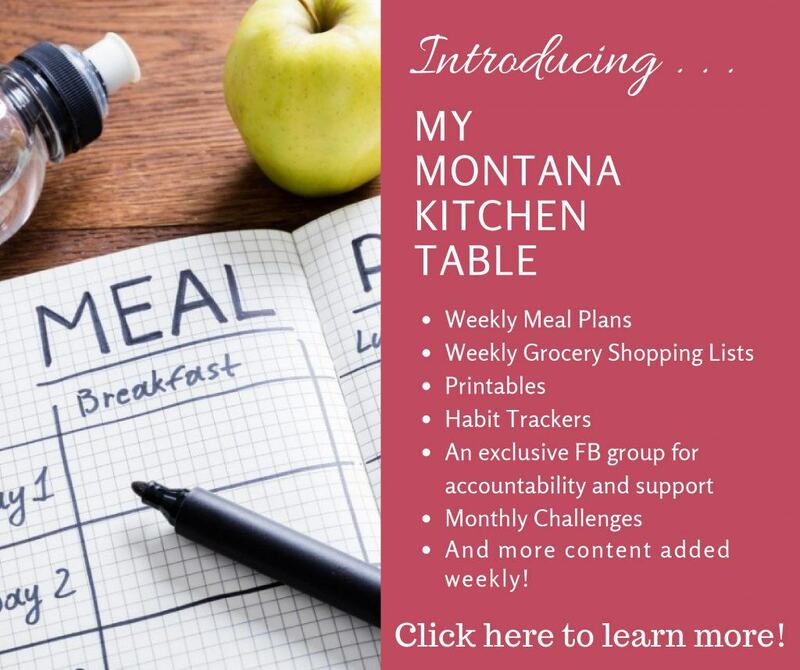 Click here for Weekly Meal Plans & Shopping Lists! Can’t wait to try this! 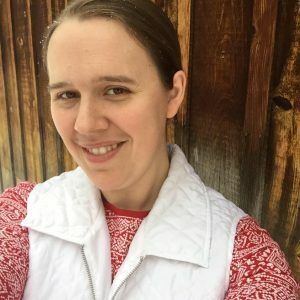 What is the measurement if I am substituting with Pyure? I needed a sweet fix so I came across your recipe for the Cinnamon Spice cake and decided to give it a try. It was DELICIOUS and so moist!! Thank you! Great cake! Thanks for the recipe!! Next time I make it, I’m going to make it a bit more cinnamon-y!!! Made this and it was a hit! Delish!!!!! Will be making it again and again!!! Thank you!! !